Frankincense is tapped from the very scraggly but hardy Boswellia tree by scraping the bark and allowing the exuded resins to bleed out and harden. These hardened resins are called tears. 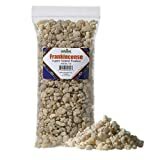 There are numerous species and varieties of frankincense trees, each producing a slightly different type of resin.